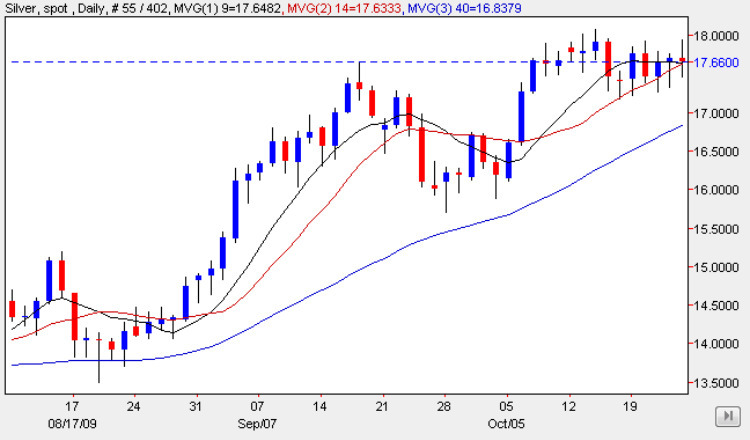 Silver spot prices ended the week much as they started, trading in a very narrow range and ending the day as a long legged doji candle, with spot silver prices once again finding some technical support from the moving averages immediately below. The technical picture for both gold and silver remains very much the same, with the long term outlook remaining firmly bullish, but with the recent sideways consolidation very much in evidence in both charts, we could see a minor pullback from the current price levels in the short term, before finding support below and them continuing the bullish move higher in due course. The difference of course with spot silver is that we are currently deep in the congestion area between $16.50 per ounce and $18.50 per ounce, and should we see this breached in due course, then this will provide an excellent platform for the next leg of the upwards journey for silver prices with all three moving averages providing excellent support. However, in the short term and as outlined above, we may see a temporary move lower, possibly to re-test support in the $17 per ounce level, and should this hold firm as expected then this will provide the necessary springboard for a move higher in the medium term.